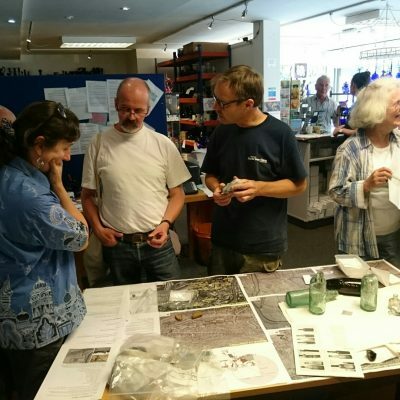 On the Saturday 6TH August 2016, the Bristol and Avon Archaeological Society teamed up with specialists from Nexus Heritage for an exciting day at the Original Bristol Blue Glass Company Studio on Bath Road, Bristol. The main aim of the event was to enable to public to bring in archaeological finds from their gardens so they could be identified – similar to the Antiques Roadshow. It was hoped this would help identify any concentrations of unknown archaeological remains in the city while also getting people interested in archaeology and showing them that archaeology is not just something that happens in a remote old landscape, but it can survive in your garden. The event was well publicised by the South Bristol Voice and the Bristol Post who attended the morning preferring it to the local cricket news! Visitors from around the city came along with archaeological artefacts ranging from Roman Pottery discovered near Blaise, Medieval earthenware pottery and later slipware fragments from Fishponds and 1920s cod bottles made by the Bristol Glassmaking family Powell. 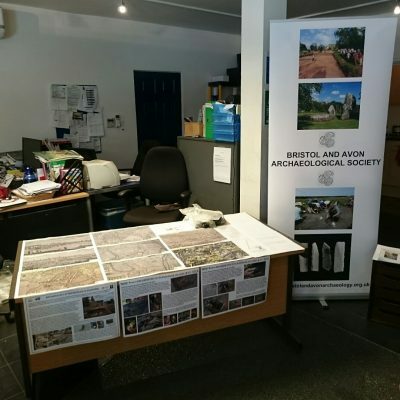 Kate Churchill, Principal Archaeologist for Nexus Heritage and Vanessa Castagnino, Archaeomaterials specialist from the University of York were on hand to identify the items and answer any questions about archaeology in general. 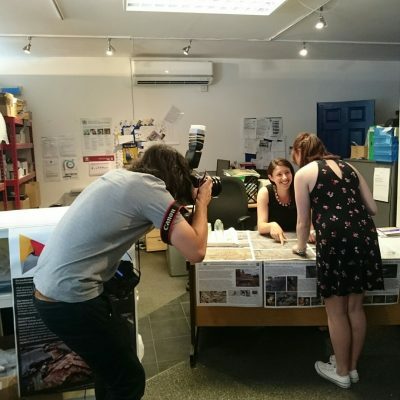 In addition to the ‘Roadshow’ Kate and Vanessa had prepared a display about the history and archaeology of Bristol Glasshouses, a booming post-medieval industry that is sadly often overlooked in Bristol’s heritage. Despite the immense potential of archaeological remains and documentary evidence there has been very little research undertaken on this subject. The first record of glass-making in Bristol refers to an Italian glassmaker in 1651, but it was not until the end of the 17th and start of the 18th century that the trade was well underway in the city. In 1696 there were nine glasshouses making bottles and flint glass, mostly located on the banks of the River Avon between Redcliff Back, Temple Back and Temple Gate. The city had a wealth of mineral and trade resources that appealed to the glassmakers and by 1755 there were 15 glass factories in the centre. 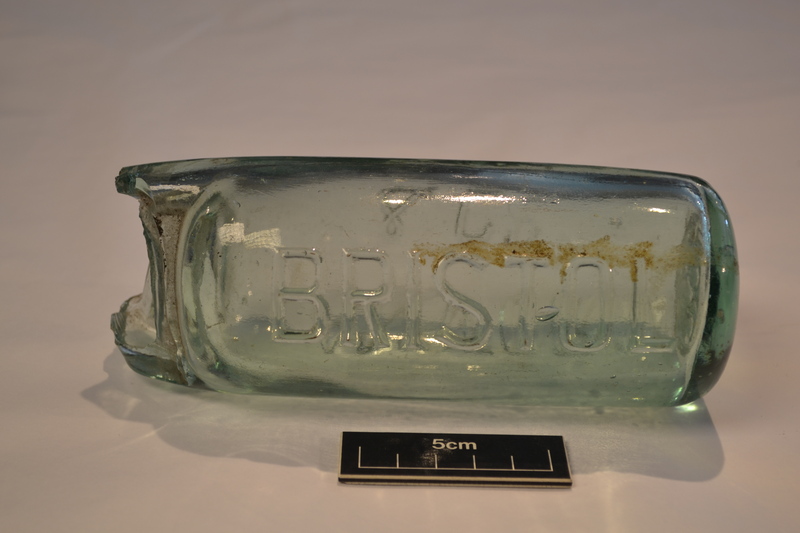 The type of glass made in Bristol was flint, crown (window) and bottle glass and their enamel and coloured glass was highly favoured and made in large quantities. When coloured glass became popular in the second half of the 18th century the glassmakers acquired cobalt from Saxony through a Westcountry porcelain manufacturer called William Cookworthy and the Bristol Blue Glass took off. Despite its success the Bristol Glass Trade came to rather sudden end at the end of the 18th century due to the 1745 excise taxes, the additional expense and time caused by the navigation and tidal nature of the Avon and the American War of Independence in 1775, the main trade link for the Bristol Glass Industry. As a result the glasshouses were often converted into warehouses and eventually demolished. Only one standing glasshouse cone still partially remains in the city and this is the restaurant for the Doubletree Hilton Hotel on Redcliff Mead Lane. 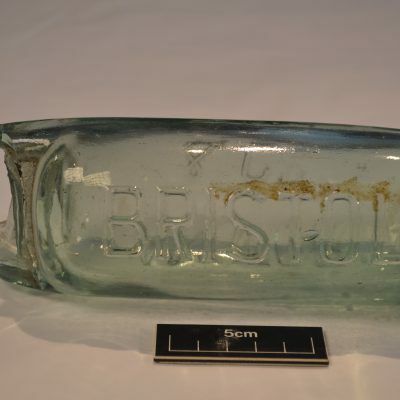 However, excavations within the city centre have recently shown that a number of known and unknown glasshouses still survive beneath the surface and a wider Bristol Glasshouse project is called for. It was suggested at the event that a Glasshouse trail around the city centre would be a great benefit to the city. In addition to the Glasshouse display which included a detailed historic map regression and archaeological assessment for each glasshouse in central Bristol, glass artefacts under analysis and photographs and site plans of excavations, the Bristol Blue Glass Company topped off the day by holding glass blowing activities and showing people around their work areas, explaining and comparing the new techniques with the traditional way of glassmaking. This showed visitors how similar the techniques were and brought the past to life. The event was a great success and the Bristol and Avon Archaeological Society would like to thank the Bristol Blue Glass Company, especially the founder Jim Adlington and glass maker Aaron Golding for hosting the event and providing such informative and exciting presentations.